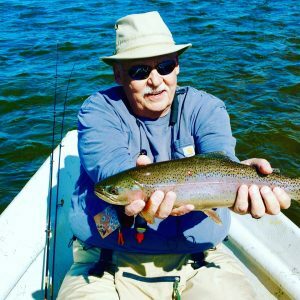 Green River Fontenelle Fishing Report Wyoming Dunoir Fishing Adv. 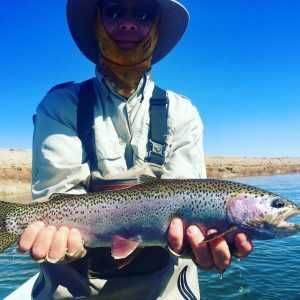 Green River Fontenelle Fishing Report Wyoming – What a stunning end to the week fly fishing on the Green River. It is not always that you get super calm and warm weather during spring on the Green. Conditions for fly fishing were perfect and raised water flows of 1900 CFS did not slow down the fishing. Guides Spike and Jeramie were both out and report solid fishing. Hot flies are annelids, sow bugs and baetis patterns. Rainbow and Brown Trout are healthy and hungry and eating nymphs. Whitefish were at a minimum and the river was not too crowded despite the beautiful weather. To see most current water flows on the Green River below Fontenelle Reservoir click HERE. To learn more about our local Wyoming fishing guides please click on our GUIDE PAGE. Spring is one of our favorite seasons to fish and guide on the Green River. Our guides enjoy fishing and guiding as water flows climb on the Green River. Keep posted for more fishing reports from the Green River to come.